If you love to hunt or know someone who does, you probably already know that the rib, loin and tenderloin cuts of an elk are just as tender and choice as their beef counterparts. The remainder of the animal is generally tough, but that doesn't mean you should simply convert it to bland, anonymous ground meat. With a bit of creativity, and a Crock-Pot or other slow cooker, those tough cuts can be turned into memorable meals. Remove any surface fat or connective tissue from an elk neck, chuck or shank roast with the tip of a sharp boning knife. If you know from prior experience that the animal has a strong, gamy flavor, soak the roast 2 hours or longer in milk or cold, salted water to help leach out the off-taste. Sear the surface of the pot roast on all sides, in a large, heavy skillet or Dutch oven. This step is optional but deepens the meat's savory flavor. Season the browned roast generously with salt and pepper, and other herbs or spices to taste. Line the bottom of your Crock-Pot with coarsely chopped onions, celery and carrots, or other aromatic vegetables as desired. Rest your roast on top of the aromatics and add a splash of wine if you wish. Shoulder roasts require no more liquid, though bonier neck and shank benefit from added liquid. A cup or two of water, broth or sauce is optional but will create more sauce for the finished dish. Strain the aromatics from your cooking liquid and skim off any fat that floats to the surface. Thicken the juices to make a sauce, and serve it with the sliced or shredded pot roast. Trim a piece of elk round carefully, removing any visible fat and patches of connective tissue. Slice the piece into ½-inch slabs, cutting across the grain. Lay each slab on its side and cut it into long ½-inch strips, then cut across each strip to make ½-inch dice. Season the cubes liberally with salt and pepper, then dredge them lightly in flour. Heat a heavy skillet or Dutch oven over medium-high heat and add a small quantity of oil. Working in small batches, sear the floured elk meat on all sides to create a brown crust. Don't crowd the pan, or the meat will steam in its own juices as it cooks. Remove and reserve each batch as it browns. Saute sliced onions in the same pan until translucent, then pour in a half-cup of water, beef broth or red wine and stir it to dissolve all the browned-on juices. Pour the onions and the juices into the bottom of your Crock-Pot and add the browned elk. Cover the elk meat completely with water, beef broth, thinned gravy or other liquid. Add garlic, bay leaves, spices or other flavorings as desired, and cook the meat on Low for 4 to 5 hours. Add diced vegetables and cook for another 60 to 90 minutes. Strain the broth into a saucepan, and thicken it on the stovetop with flour or cornstarch. Stir the gravy back into the elk and vegetables, and adjust the seasoning as needed. Serve hot. Prepare four to six portions of elk round, or "simmering" steak, by trimming them of any excess fat or gristly connective tissue. Sear each steak briefly in a hot skillet to brown it and create savory, aromatic flavors. Line the bottom of your Crock-Pot with a cup or two of aromatic vegetables, such as onions, celery, garlic, fennel or carrots. Layer the steaks over the aromatics, then add enough water, gravy, broth or flavorful sauce to cover the steaks. Cook the steaks on Low for 8 to 10 hours, or on High for 4 to 5, until they're fork-tender and their sauce or cooking liquid develops a rich and concentrated flavor. Carefully lift out the steaks with a slotted spoon and transfer them to a serving platter to keep warm. Strain the aromatics from the broth or sauce, if appropriate. Thicken the sauce as needed, then taste it and adjust the seasoning. Serve the steaks with your favorite side dishes, with their sauce spooned over top. Depending on the flavorings you choose, elk pot roast or braised steaks can be shredded for use in tacos, pasta dishes or barbecue sandwiches. 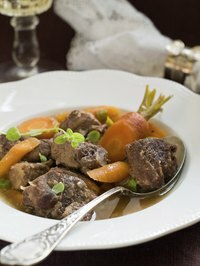 Bite-sized pieces of stewed elk, rather than being used for stew, can be served over mashed potatoes, rice, polenta or pasta as an entree. Adapt your sauce or gravy as necessary, to meet the correct flavor profile. The U.S. Department of Agriculture's official recommendation is to cook all game meats to 160 degrees Fahrenheit or higher. With slow-cooked elk this is a moot point, as the usual end temperature of the braised meat is 20 to 40 degrees higher. Farmed elk, if you can find it, is tenderer and quicker cooking than wild elk. Cooking times will only be about two-thirds as long as for wild-caught animals.